Every night between November and March, a steady trickle of American Crows pours through the skies of Lawrence and Andover, MA. The trickle quickly becomes a stream. Soon, a deluge. Crows spread from horizon to horizon as they fly together to their communal roost. The number of crows varies every year, but there can be as many of 12,000 or 15,000 at a time. The word “Hitchcockian” does not accurately describe every mass gathering of birds, though the term is used broadly. Murmurations of European Starlings dance and contort themselves in the sky, recalling a moving sculpture. Staging flocks of migratory Tree Swallows are clamorous and chaotic, but the birds move with a light and airy agility that lends a whimsical feel to the spectacle. American Crows, on the other hand, flow by steadily in a single direction. Their pace is deliberate, and their rowing wingbeats inexorable. Uniformly black, crows appear at dusk as large, dark shadows against the sky. They even sometimes approach people out of curiosity and stare at us with an unreadable avian gaze. These are the birds that inspired Hitchcock’s eponymous movie, playing off humans’ unease. In reality, though, members of the crow family are harmless, cooperative, and even empathetic. And while some causal observers might find a crow roost uncanny, birdwatchers and nature-lovers often find in them a source of wonder and beauty. As some of the world’s most intelligent birds, what could American Crows be up to at these roosts? Traditional theories dictate that crows roost together for safety or warmth, or use communal roosts to be able to select mates from a larger pool of candidates. But hungry crows also follow better-fed birds from the roost in the morning, suggesting they are seeking out productive feeding sites, and that roosts can facilitate cooperation. Some roosts are furthermore located strategically near feeding sites, such that crows can grab a reliable snack when they leave for the day and when they return at night. Thousands of crows gathering together in the same place every night make easy pickings for predators like Great Horned Owls. As a result, American Crows gather at a secondary location, or “staging area,” before continuing on to their real roost after nightfall. American Crows will further confuse predators by changing the location of the staging area, or even the roost itself, every few nights. Some human observers confuse these staging areas for the actual roost, not knowing the roost is several hundred feet to several miles away— unless they stay after dark to watch the crows move a second time. The American Crows in Lawrence are surprisingly wide-ranging when not at their roost. Pellets they cough up have revealed saltmarsh snails, telling us that they forage at least as far away as the New England coast. Some of the birds are seasonally migratory, and spend the breeding season far to the north on the St. John’s River in Canada. To find the crow roost in Lawrence, park in the lot for the New Balance factory on the east side of South Union Street. Cross the street and slowly, quietly, walk partway over the bridge on the Merrimack River. The crows should be in the trees on the north side, numbering into the thousands. Check out the surrounding area for the crows’ staging grounds as well- they have a particular affinity for the parking lots in the industrial park between South Canal Street/Andover Street and the river, as well as Island Street and Pemberton Park. Some of these birds will be returning to their breeding ground soon, with the rest pairing off and dispersing throughout the state- shutting down the roost until November. Try to catch the spectacle while you still can, or make a plan to check it out next winter. This entry was posted in Birds and Birding and tagged American Crow, corvus brachyrhyncos, migration, roost, social birds, wildlife migration on March 15, 2018 by William Freedberg. 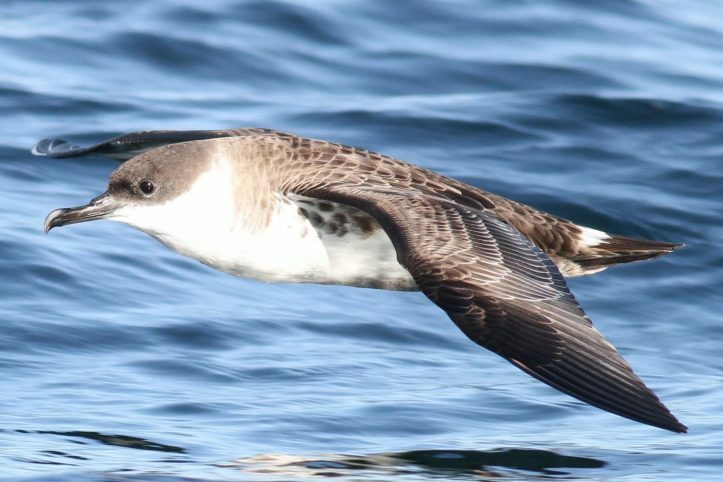 While New England football fans are anxiously following the fortune of the New England Patriots, ornithologists at the Stellwagen Bank National Marine Sanctuary are tracking the trans-equatorial movements of Great Shearwaters (individuals in this year’s group are named after Patriots players). 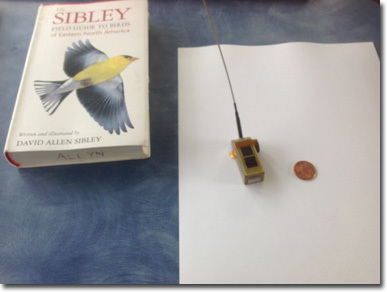 Through the use of sophisticated satellite technology, tiny transmitters now have the capacity to follow the movements of birds and secretive mammals more than a hemisphere away practically in real time. Followers of Distraction Displays may recall that in late summer seabirds called Great Shearwaters made headlines when exceptional numbers were observed feeding on many thousands of Menhaden (small forage fish) in the surf-line at Provincetown on the tip of Cape Cod. Although most of these shearwaters have long since retreated toward their nesting grounds on the remote archipelago of Tristan du Cunha deep in the South Atlantic Ocean, scientists nonetheless now know precisely where some individuals are located! While satellite tracking has been used to monitor wildlife for 20 years or more, the weight and size of transmitters today makes it possible to follow wildlife significantly smaller than eagles and bears. This summer, waterproof transmitters called PTT (Platform Transmitting Terminal) tags weighing only 12 g and manufactured by Microwave Technology were affixed to shearwaters off Cape Cod during the month of August. 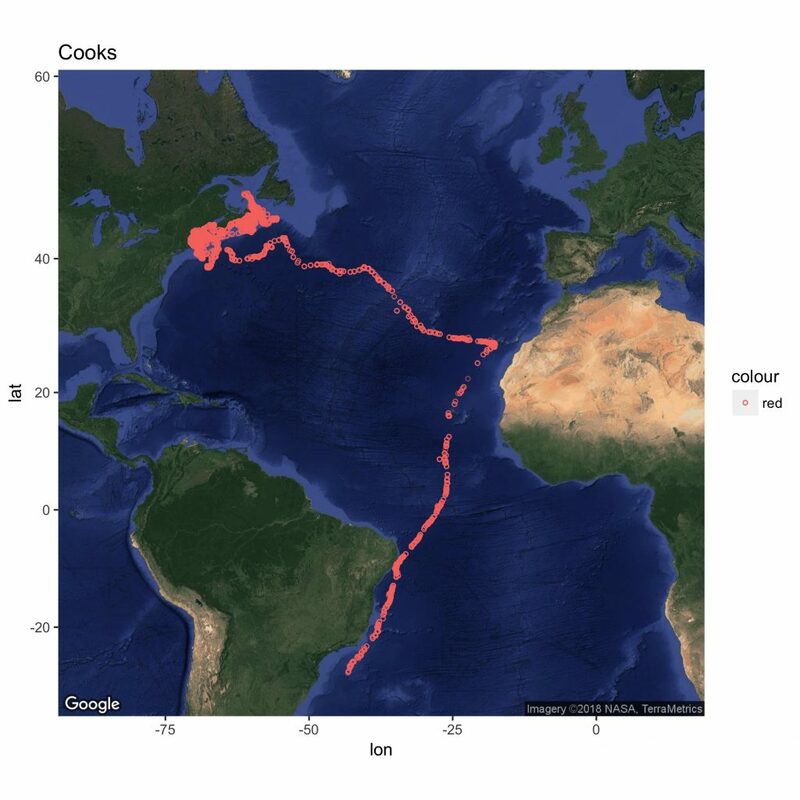 Of nine tags originally affixed to Great Shearwaters and one to a Sooty Shearwater this summer, one is still generating round-the-clock signals from Argos satellites orbiting the earth at approximately 528 miles above the ground. The unique signals generated by the transmitters are regularly received by Argos and eventually made accessible to the researchers who are mapping the movements of the shearwaters. Needless to say the technology involved is complex, but the information gathered is elegant. 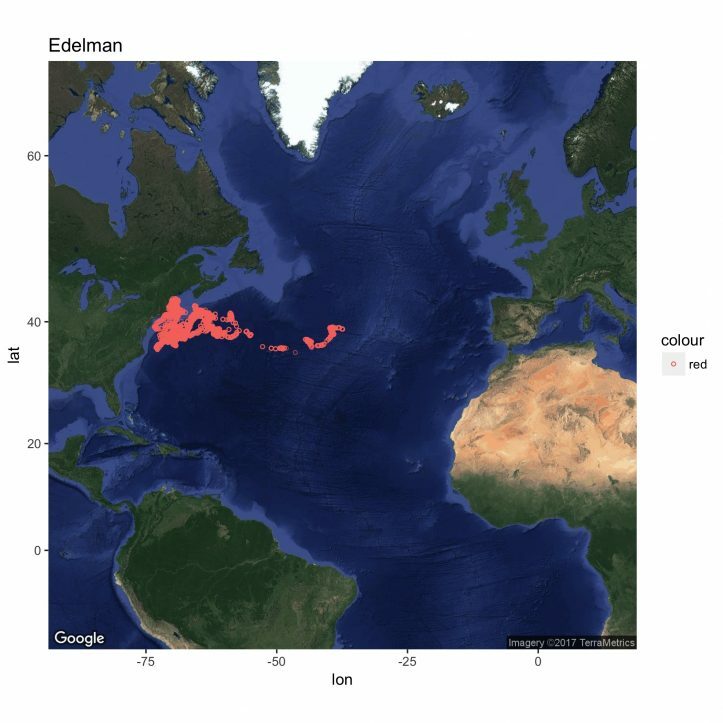 The 10 shearwaters tagged this summer were all named after New England Patriots players. Of the 10 tagged shearwaters, only Gronkowski’s transmitter was still sending signals on January 2, 2018. Gronkowski crossed the equator on December 19, and as of Jan. 2 was at 16.5 degrees South in deep water (>2000 meters) off the coast of Brazil near Banco Minerva—a semount <100 meters deep. Go Gronk! Cooks crossed the equator on December 12, but its transmitter stopped working on Christmas Eve at 27 degrees South in deep water (>2500 meters) off of Paraguay. McCourty’s tag stopped working on December 19, hours after crossing the equator. Edelman was still in the mid-Atlantic on Dec 12, and unfortunately Brady’s Sooty Shearwater transmitter cut out while the bird was off Morocco in mid-October. All of the tagged shearwaters were aged by plumage to be either one or two years-old, and most will not likely return to Tristan du Cunha this winter because few are likely to attain breeding age until they are at least 5-6 years-old. These sub-adult individuals will very likely remain on the Patagonian Shelf until March/April before beginning their northward migration, which will initially bring them up the east coast of South America before reaching North Atlantic waters and the Gulf of Maine. This entry was posted in Birds and Birding, Research and Monitoring and tagged birding, birds, migration, monitoring, NOAA, research, satellite tagging, Stellwagen Bank National Marine Sanctuary on January 4, 2018 by Wayne Petersen. Every year, at about this time, dedicated hawk watchers and serious raptor aficionados begin paying particular attention to radar images and weather prognostications on the evening news. Indeed, some devotees even regularly take their vacation in the middle of September. So what’s so special about mid-September? 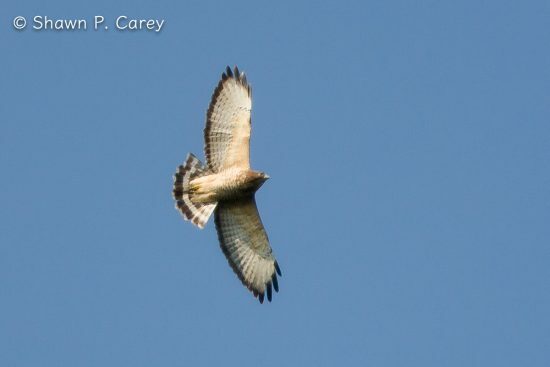 To those in the know with an interest in hawk migration, mid-September is THE time to intercept the peak southward departure of the Broad-winged Hawk (Buteo platypterus). Adult Broad-winged Hawks are 15 inches-long with a 24 inch wing-spread, a black tail crossed midway with a single wide, white band, a brown back, and rusty-brown underparts. In flight they are compact, with broad wings that are pale underneath and traced with a thin black border around the edges (as shown in the above photo). Ranging throughout most of the eastern United States and southern Canada west to Alberta, Broad-wings spend much of their summer hunting amphibians, snakes, small mammals, and birds to feed their young. However in mid-September it is the spectacular autumn migration of this species that annually captivates and mesmerizes hawk watchers, and often even the general public as well. Unlike other raptors (or most other species of birds for that matter) few have such a telescoped seasonal departure as the Broad-winged Hawk. With seemingly mathematical precision, much of the North American breeding population typically initiates its southward migration sometime between September12–20. Depending upon weather conditions, in some years this time window becomes even more compressed, occasionally with many thousands of individuals passing favored observation sites literally within a few hours. Here in Massachusetts, Wachusett Mountain in Princeton, Mt. Watatic in Ashburnham, and Mt. Tom in Holyoke are among the better places to witness this phenomenon. In mid-September Broad-wings across much of their breeding range wait strategically for the passage of cold fronts accompanied by falling temperatures and light winds from the north side of the compass to begin their migration. Under such conditions the hawks almost simultaneously begin lifting up from the summer woodlands where they nested to search for rising warm air masses called thermals that will help eventually transport them to South America for the winter. Using such thermals to carry them skyward many thousands of feet, eventually the Broad-wings break out of the thermals and travel to another thermal, often several miles away, by means of long, high-speed power glides that cause them to gradually lose altitude at the same time. Once they reach another thermal, they then ride the new “escalator” skyward. Because hundreds of Broad-wings are using this same strategy, on a good day for migration, a large thermal often contains many hundreds of tightly soaring individuals all rising upwards at the same time. In hawk parlance such an aggregation is called a “kettle” (shown below). 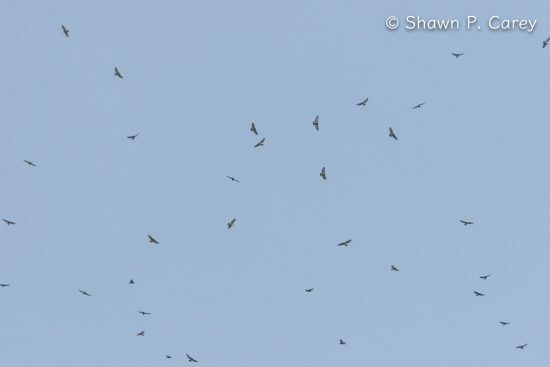 On days favorable for migration, many thousands of Broad-winged Hawks make their way southward at the same time using this combination of riding warm air thermals upward for lift, and then power gliding to another thermal so they can regularly cover hundreds of miles a day under ideal conditions. The migration tends to follow the southwesterly leading line created by the Appalachian Mountains. Between the thermal-and-glide strategy, and wind lift created along Appalachian ridgetops, the hawks gradually make their way to the Gulf Coast, where they gradually “turn the corner” in southern Texas to avoid crossing the Gulf of Mexico, and then make their way into Mexico and south through Central America, and finally into northern South American where most will spend the winter. Not surprisingly there are variations in this strategy along the way, including several world-famous hawk-watching bottlenecks where, with several other species, they pass through Mexico, Costa Rica, and Panama. While this is by no means the full story, it is the essence of how each year this magnificent raptor accomplishes one of the most amazing autumn migrations in the western hemisphere. This entry was posted in Birds and Birding and tagged autumn, birding, birds, migration, raptors on September 19, 2017 by Wayne Petersen.